The popular image that has recently been constructed through various media – primarily the internet, but also artistic works and academic writing – about the formal and iconographic features, as well as the origin and socio-political functions of monuments erected throughout the former Socialist Yugoslavia in the second half of the 20th century serves not only as a mirror of contemporary prejudice and/or desire of what the socialist monument must/might have stood for, but also generates a number of misleading notions about this memorial corpus as a whole. Departing from several such misconceptions, we shall try to offer a more objective analysis of what the term spomenik predominantly denotes. In order to demystify the formal peculiarity of the “famous” examples reproduced in the media, we shall present the genealogy, as well as the morphological and formal heterogeneity of the corpus as a whole. What were the quantity, classification, and thematic scope of Yugoslav monuments? How did different subjects – historical events, persons or social groups, universal ideas, or authentic locations – condition their size, iconography, spatial (dis)position, morphological references, and formal characteristics? By answering these questions, we shall present an overview of the typology of the monuments illustrated by characteristic examples from Croatia, Slovenia, and Vojvodina, and indicate the origins, development, and art historical references that conditioned their formal features. 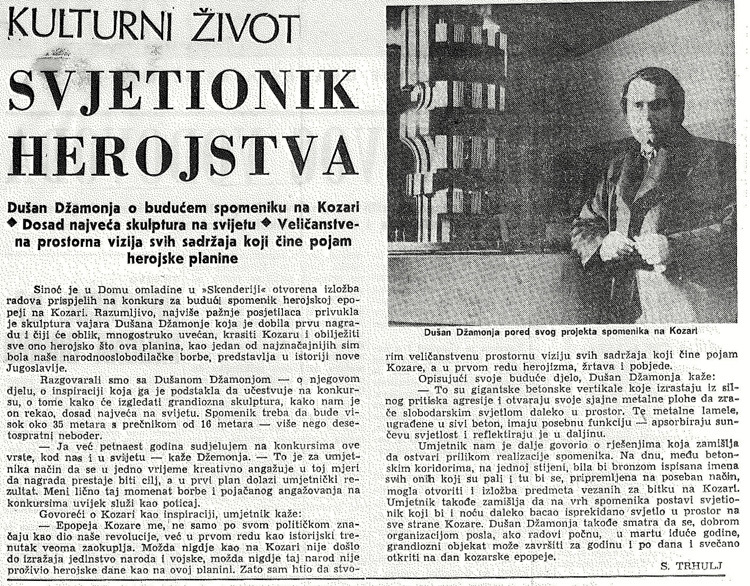 Zdenko Kolacio, Monument to the Insurgents, Abez forest (near Vrginmost, Croatia), 1966, Arhitektura – časopis za arhitekturu, urbanizam, dizajn i za primijenjenu umjetnost 155 (1975),42. 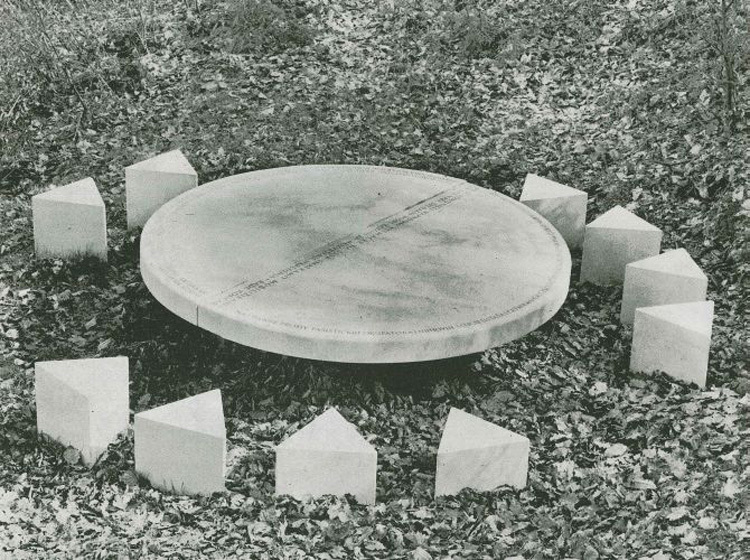 Based on the thesis that different social and political groups composed a complex and dynamic system of the initiation, production, reception, and the use of monuments in Socialist Yugoslavia, the second lecture will be focused on the two components crucial for the development of their formal and aesthetic features: their artistic production and critical reception. The close reading of the essays and interviews with the artists and architects who participated in the creative process of the creation of the monuments and memorial objects on the one hand, and the art criticism of their work, as well as theoretical essays on the meaning and possibility (Radoslav Putar, 1961) of monuments in the context of the self-managed socialist society, on the other, will offer new perspectives for a better understanding of the artists’ relation to their ideological work, the impact of the critical discourse on monuments on their artistic quality, and the legality of the commissioning procedure. Sanja Horvatinčić has been a PhD candidate at the Post-graduate Study of Humanist Sciences, University of Zadar, since 2011 and works as a Research Assistant at the Institute of Art History in Zagreb. She is the executive editor of the journal Život umjetnosti, and a team member of the scientific project ARTNET led by dr. sc. Ljiljana Kolešnik. She is the author of several scientific papers, and has given a number of scientific and popular public lectures on memorial sculpture/architecture in Yugoslavia and Europe after World War II.